That's the recommendation from a new report by the US National Research Council, who say reclaimed waste water is needed as a necessary substitute for the dwindling supply of freshwater. 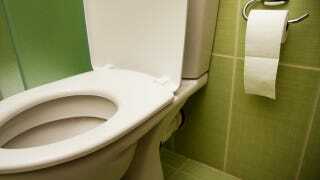 What's more, reprocessed urine might actually be cleaner than freshwater. As we consider the "Kevin Costner in Waterworld" school of water management, let's look at how we got here. According to committee chair R. Rhodes Trussell, the treatment process is now advanced enough that processed wastewater can become a significant part of our clean water supply. Although this processing is likely to be more expensive than water conservation efforts, it is a generally cheaper alternative to desalinization and other methods for generating new water supplies. And, like it or not, reprocessed waste water has already been an unofficial part of many water supplies. After all, many treatment plants get their waters from the same rivers that cities upstream use to dump out their waste water. Though that doesn't technically count as reuse, that's what it really is. This proposal just calls for cities to start recycling their own water supply, rather than shift it along to the poor jerks downriver. The committee also found that the amount of chemicals and microbes found in the reclaimed waste water was generally comparable to or lower than that found in our current freshwater supplies. I think that's meant to make me feel better about the prospect of drinking cleaned up pee, but really that's just got me worried about the freshwater. In any event, leaving aside the whole "this is kinda disgusting" aspects of the proposal, it's as sensible a way as any to deal with coming water shortages. Of course, if this entire proposal is just a way for scientists to freak out the public and get them to conserve water for fear of having to drink urine...well, I think they've sorely underestimated how committed we are to wastefulness, honestly. Original report via National Academies. Image by dundanim, via Shutterstock.